The gentrification myth: It’s rare and not as bad for the poor as people think. It’s extremely rare and not as bad for the poor as you think. 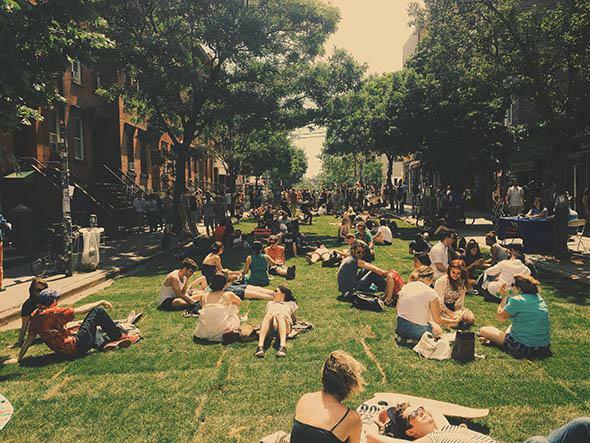 A summer festival in June 2014 in Williamsburg, Brooklyn. It started in Soho, then moved to Chelsea and the East Village. Riots in Tompkins Square in 1988 earned it some headlines but didn’t stop its creeping advance. It moved on to lower Harlem, then jumped the river to Park Slope. Williamsburg and Fort Greene followed; today, it threatens even Bedford-Stuyvesant. New York isn’t the only city where it spreads. San Francisco, Washington, and Boston have arguably been even more affected by it. Seattle, Atlanta, and Chicago have experienced it on a large scale, too. The “it,” as you may have guessed, is gentrification. If you live in one of these cities, you probably think you know how it works. Artists, bohemians, and gay couples come first. They move into run-down—but charming and historic—homes and loft spaces close to the urban core. Houses are restored. Funky coffee shops appear. Public safety improves. Then rents and home prices start to go up. The open-minded, diversity-loving creative types who were the first wave of gentrifiers give way to lawyers, bankers, and techies. As rents and home prices continue to rise, the earlier residents—often lower-income people of color—are forced out. That’s the story, at least. Read the Atlantic’s City Lab, and you regularly encounter titles such as “Why Gentrification Is So Hard to Stop” and “There’s Basically No Way Not to Be a Gentrifier.” Liberals and conservatives alike agree that it is bad (although liberals blame developers, and conservatives blame onerous regulations that limit development). Even Jezebel has joined in. It recently chided Taylor Swift (who earlier this year traded her comparatively affordable $2 million apartment in Nashville for a $20 million penthouse in Tribeca) for including an “obtuse” “gentrification anthem” in her latest album. That gentrification displaces poor people of color by well-off white people is a claim so commonplace that most people accept it as a widespread fact of urban life. It’s not. Gentrification of this sort is actually exceedingly rare. The socio-economic status of most neighborhoods is strikingly stable over time. When the ethnic compositions of low-income black neighborhoods do change, it’s typically because Latinos and other immigrants move into a neighborhood—and such in-migration is probably more beneficial than harmful. As for displacement—the most objectionable feature of gentrification—there’s actually very little evidence it happens. In fact, so-called gentrifying neighborhoods appear to experience less displacement than nongentrifying neighborhoods. It’s time to retire the term gentrification altogether. Fourteen years ago, Maureen Kennedy and Paul Leonard of the Brookings Institution wrote that gentrification “is a politically loaded concept that generally has not been useful in resolving growth and community change debates because its meaning is unclear.” That’s even truer today. Some U.S. cities do have serious affordability problems, but they’re not the problems critics of gentrification think they are. Worse, the media focus on gentrification has obscured problems that actually are serious: the increasing isolation of poor, minority neighborhoods and the startling spread of extreme poverty. Gentrification, as it is commonly understood, is about more than rising housing prices. It’s about neighborhoods changing from lower-income, predominantly black or Latino neighborhoods to high-income, predominantly white neighborhoods. Demographers and sociologists have identified neighborhoods where this kind of displacement has occurred. Wicker Park in Chicago, Harlem and Chelsea in Manhattan, Williamsburg in Brooklyn—these places really did gentrify. Sociologists and demographers captured these changes in case studies and ethnographies. But starting a decade ago, economists began to ask more nuanced questions about the displacement the other social sciences were documenting. Simply documenting that low-income people were being forced out of a neighborhood whose housing prices were rising didn’t mean in and of itself that gentrification was causing displacement, they noted. Poor people often move away from nongentrifying neighborhoods, too. Indeed, low-income people move frequently for a variety of reasons. The real question was whether low-income residents moved away from “gentrifying” neighborhoods at a higher rate than they did from nongentrifying neighborhoods. 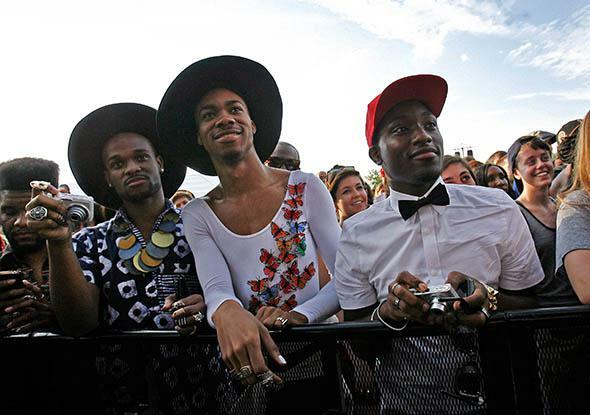 Fans watch as Solange performs during the Northside Festival at McCarren Park on June 16, 2013, in Brooklyn. One of the first people to explore this question in a sophisticated way was University of Washington economist Jacob Vigdor. In 2002, Vigdor examined what had happened in Boston between 1974 and 1997, a period of supposedly intense gentrification. But Vigdor found no evidence that poor people moved out of gentrifying neighborhoods at a higher than normal rate. In fact, rates of departure from gentrifying neighborhoods were actually lower. It wasn’t just Boston. In 2004, Columbia University economists Lance Freeman and Frank Braconi conducted a similar study of gentrification in New York City in the 1990s. They too found that low-income residents of “gentrifying” neighborhoods were less likely to move out of the neighborhood than low-income residents of neighborhoods that had none of the typical hallmarks of gentrification. Of course, displacement is not the only way in which gentrification could harm the poor. Residents of gentrifying neighborhoods might stay put but suffer from rising rents. Freeman and Braconi found that rents did rise in gentrifying neighborhoods in New York. But rising rents had an unexpected effect: As rents rose, residents moved less. In 2010, University of Colorado–Boulder economist Terra McKinnish, along with Randall Walsh and Kirk White, examined gentrification across the nation as a whole over the course of the 1990s. McKinnish and her colleagues found that gentrification created neighborhoods that were attractive to minority households, particularly households with children or elderly homeowners. They found no evidence of displacement or harm. While most of the income gains in these neighborhoods went to white college graduates under the age of 40 (the archetypical gentrifiers), black high school graduates also saw their incomes rise. They also were more likely to stay put. In short, black households with high school degrees seemed to benefit from gentrification. 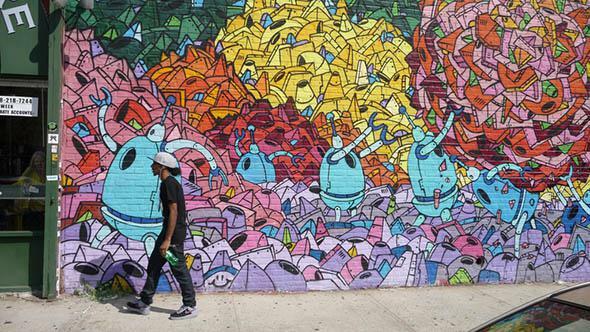 A man walks in Williamsburg, Brooklyn, in September 2010. In other words, the problem isn’t so much that gentrification hurts black neighborhoods; it’s that it too often bypasses them. Harvard sociologists Robert Sampson and Jackelyn Hwang have shown that neighborhoods that are more than 40 percent black gentrify much more slowly than other neighborhoods. The apparent unwillingness of other ethnic groups to move into and invest in predominantly black communities in turn perpetuates segregation and inequality in American society. While critics of gentrification decry a process that is largely imaginary, they’ve missed a far more serious problem—the spread of extreme poverty. Last year, economists Joseph Cortright of the Portland, Oregon–based Impresa Consulting and Dillon Mahmoudi of Portland State University set out to examine how America’s poorest urban neighborhoods had changed over time. They started by going back to 1970 and identifying 1,100 census tracts—the county subregions that demographers use as a basic unit of analysis—located within 10 miles of the central business districts in the 51 largest cities with high levels of poverty. They then asked a simple question: How did the socio-economic status of these places change during the next 40 years? The answer: Most had not. Two-thirds of high-poverty neighborhoods in 1970 were still high-poverty neighborhoods in 2010. Only about 100 neighborhoods saw their poverty rates decline to below the national average. The typical metropolitan area had one or two high-poverty neighborhoods that could conceivably be described as gentrifying. However, Cortright and Mahmoudi did find another, more significant change. Whereas in 1970, 1,100 census tracts within 10 miles of central business districts had poverty rates of 30 percent or higher, by 2010, the number of poor census tracts had jumped to 3,100. In other words, the number of high-poverty areas close to central business districts had nearly tripled. To make matters worse, the number of people living in extreme poverty in those areas had doubled. The residents of these neighborhoods are disproportionately black. If gentrification occurs so infrequently—and if it may help rather than hurt existing residents—why are so many people so upset about it? There are at least a couple of reasons. The first has to do with where it happens. According to Cortright and Mahmoudi, just three cities—New York, Chicago, and Washington—accounted for one-third of all census tracts that saw poverty rates decline from above 30 percent in 1970 to below 15 percent in 2010. Half of all the areas in the nation that “gentrified” (if we still want to call it that) were located in those three cities. No wonder New Yorkers and Washingtonians think gentrification is a big deal. People at a park in Brooklyn during the summer of 2011. The other reason we continue to talk about gentrification probably has more to do with middle-class fears. Housing prices in America’s most expensive coastal cities have risen sharply since the end of the Great Depression. Expressing concern about “gentrification” in those cities may simply be another way of expressing concern about rising housing prices. But in fact, different types of cities have very different kinds of affordability problems. In coastal cities, the cost of housing is often far higher than the cost of construction. That is primarily because supply is constrained. Builders in Washington can’t turn Adams Morgan’s row houses into a high-rise apartment district, so row house prices rise. High demand plays a role too, of course. Some of that demand reflects a preference for older, close-in housing stock. The fact that global cities deliver high wages to the most skilled workers is almost certainly more important though. Gentrification isn’t the cause of these cities’ affordable housing problem. It’s a symptom. There’s a large group of cities with a very different affordability problem. These are Rust Belt cities such as Detroit where housing sells at or below the cost of construction. These are cities with an income problem. Cities where the cost of housing is far higher than the cost of construction require different policy solutions than cities where the situation is reversed. Coastal cities can benefit from requirements that developers set aside a portion of new units as affordable housing, although some economists argue that such zoning requirements can actually backfire by raising the cost of new housing even more, and all agree that the effect of such set-asides will be minimal. It certainly won’t reverse the transformation of these cities into enclaves for the rich. In contrast, many residents of Rust Belt cities would benefit from rent subsidies (or cash subsidies, period), not set-asides. Yet policymakers all too often fail to fit remedies to the circumstances. Rust Belt cities require set-asides just like San Francisco, while Bay Area institutions such as Stanford hand out generous housing subsidies to new faculty, a measure that only serves to drive housing prices up, instead of searching for ways to increase supply. Retiring the term gentrification won’t do anything to address these problems, of course. But it will remove a distraction. Let’s examine how neighborhoods really change and why some don’t. Let’s debate supply constraints (in addition to providing affordable housing) in the San Franciscos of America and figure out how to provide rent subsidies in the Rust Belt. It won’t be as fun as decrying or defending gentrification, but at least it will be directed at problems that are real.